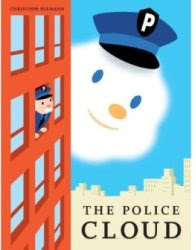 Comics in the Classroom - Kids' Book Corner: The Police Cloud: Okay, I’ll read it….AGAIN! The Police Cloud: Okay, I’ll read it….AGAIN! Hokey Smokes, am I glad this book is cool beans or I would be seriously sick of it right now (please keep reading despite the odd word choices in this sentence...please). For instance, there are only so many times a man can read Care Bears What Makes You Happy? before contemplating the positive merits of book burning. Some of my favorite books and comics (both for kids and adults) employ the use of “child logic” to tell the story. This can be crazy and fun and a completely natural way to tell a story. If you have ever tried to get a classroom of six year olds to write individual or whole class stories that make sense, you know what I’m talking about. Teachers have to spend a long time explaining to new writers that you can’t have aliens come down and blow everything up in EVERY story. And how did everyone get into the kitchen when they were just out swimming at the beach? And who is Charlie and why are the two of you flying over the desert in a hot air balloon when you were just in school last sentence? Kid logic stories are a lot of fun to read (when the kids are not about to write state/province standardized tests J ) and The Police Cloud is no exception. A cloud becomes a police officer (on the recommendation of his friend, the police helicopter) and hijinks ensue. Nothing seems to work out but then it all works out in the end with the help of a panicking burning building. Phew! The story is silly and solid and simple and the amazing art goes along for the crazy ride. The art is bright and alive and it sticks to the same child logic of the writing. For instance, things change size to fit the scenarios all the time. One minute the police chief is regular sized in his office and the next he is outdoors and as big as the tallest high-rises. I think author/illustrator Christoph Niemann is my new favorite find of the year. I can’t wait to see what he comes up with yet. It is crazy fun, and my little girl loved it. It is a quick read, which is great because she won’t stop asking to have it read. Over and over and over and over (get the point?) again. When I first brought it home we read it at least five times before bed. That one will be hard to beat.